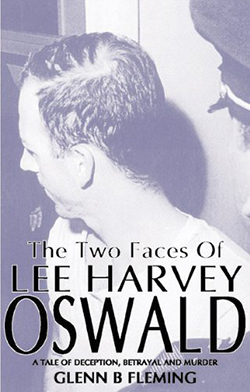 Buy "The Two Faces of Lee Harvey Oswald"
Of all the millions of words written in anger or certainty regarding arguably the greatest murder mystery of all time, the assassination of President John Fitzgerald Kennedy, one testimony remains glaringly absent. The deposition of Lee Harvey Oswald, the alleged assassin, was silenced by Jack Ruby‘s bullet before he could tell his story to a shocked and grieving world. The Two Faces of Lee Harvey Oswald is a unique work. No other book in the public domain concentrates on Lee Oswald‘s point of view; a young man caught up by, then hopelessly trapped in, history. From the moment of his return from the Soviet Union, Oswald became tangled in a web of intrigue, deception and murder. And yet, no amount of speculation or rumour mongering can lend history in general and Oswald in particular, his own words. "I‘m just a patsy!" Oswald screamed, as he was led along a corridor in the Dallas Police Building, shortly after his arrest that fateful weekend. We will never truly know how innocent, or guilty, Oswald was. But his memory deserves a hearing. The most accurate hearing possible. Glenn B Fleming was born in Manchester, England and has spent the last thirty years researching this book. In 1973, a chance encounter with a magazine article and several conversations led him to begin research into the assassination of President John F Kennedy. Though the trail was by then ten years old, Fleming‘s meticulous research led him to conclude that Lee Harvey Oswald had not played any part in the actual shooting of JFK but may, incredibly, have been infiltrating the group that were planning the murder. Since publishing a series of articles in the magazine UNDERCOVER in 1993, Fleming has remained silent, although his research continued. The result is ‘The Two Faces of Lee Harvey Oswald‘ - a stunning trip through perhaps the most famous crime of the twentieth century through the eyes of John F. Kennedy‘s alleged assassin.